Gotham is a cop drama about James Gordon’s early days as a detective in pre-Batman Gotham City—so why does it begin with Selina Kyle sneaking across a rooftop? First impressions are important, and the opening scene of Gotham’s pilot establishes that this episode is about the Batman mythos first and foremost, placing Gotham’s Finest in supporting roles that serve one primary player: the legend of the Dark Knight. Bruce Wayne (David Mazouz) may be 12 years old in this show, but the shadow of his future self looms large on the first episode. That opening sequence ends with Selina (Camren Bicondova) witnessing the murders of Thomas and Martha Wayne—a scene that vividly captures the brutality and terror of that moment for a young Bruce—and there are multiple conversations that foreshadow the rise of a new protector for Gotham City. The show is constantly reminding the audience of the Batman connection, primarily by fleshing out the supporting cast with characters that will grow to become major villains for the caped crusader. 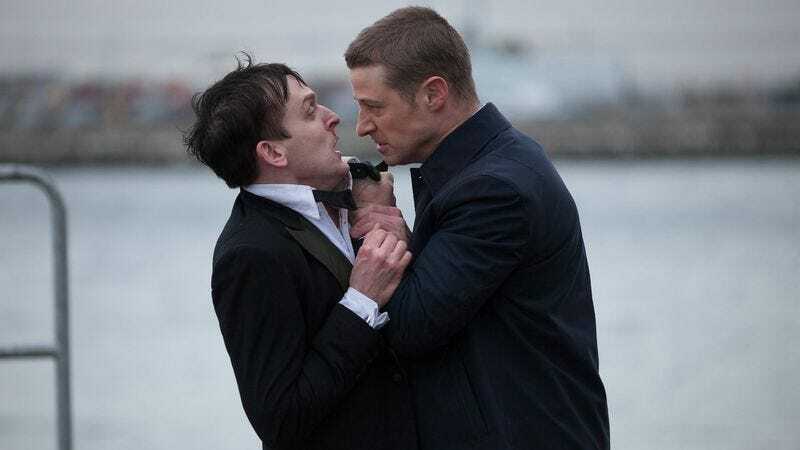 Oswald “Penguin” Cobblepot (Robin Lord Taylor) has the largest role of all the Bat-rogues in this pilot, playing the duplicitous right hand man of up-and-coming crime boss Fish Mooney (Jada Pinkett Smith), a new character created for this series. Now named Ivy Pepper (Clare Foley) instead of the far less groan-worthy Pamela Isley, the future Poison Ivy appears as the young daughter of a man framed for the Waynes’ deaths, and Edward Nygma (Cory Michael Smith) has the most obnoxious debut of the bunch as the Gotham City Police Department’s forensics expert with a penchant for speaking in riddles. Carmine Falcone (John Doman) is a major, but less well-known Batman villain, and he makes the strongest debut of all the established villains. Doman commands attention as he comes to the rescue of Gordon and Harvey Bullock (Donal Logue) in the episode’s final act, and he delivers a speech that delves deep into his motivations as a character to bring some much-appreciated moral complexity to the proceedings. A crime boss with delusions of nobility and the officers of the GCPD in his pocket, Falcone is being set up to play this season’s Big Bad, but a forthcoming mob war could mark some major changes for the landscape of Gotham’s underworld. The highlight of Gotham’s pilot, Jada Pinkett Smith’s Fish Mooney doesn’t exist in the same world as the rest of the characters, but maybe it’s the world that this show should inhabit. Possessed by the sultry spirit of Eartha Kitt, Pinkett Smith dives into the cartoonish campiness of the 1960s Batman TV series to chew the scenery to bits, and it’s a hell of a lot of fun to watch. The majority of this pilot takes itself oh so seriously, but Fish Mooney’s exaggerated characterization makes for a refreshing change of pace. Pinkett Smith isn’t the only actor giving an over-the-top performance, but the exaggeration of characters like Nygma and Cobblepot is intended to remind people of the villains they will become. In the case of those rogues, that cartoonish quality is a storytelling short cut, quickly connecting the Gotham interpretations of these characters with their established personalities as Batman villains. In Fish Mooney’s case, the exaggeration is the character; she’s beautiful, rich, and in control, and she wants everybody to know that. Pinkett Smith uses this as the opportunity to go full diva, and she’s a breath of fresh air whenever she appears in this smoggy pilot. All the established characters are given a purpose in this episode except for Selina Kyle, who starts off the whole shebang. Bicondova has very feline features, but that doesn’t mean that she should have the character depth of an actual cat. Selina is silent for the entire episode, which makes me worry about the quality of Bicondova’s acting when she’s given actual lines. The main thing to take away from Selina in this pilot is that she’s really bad at being inconspicuous, whether she’s pick pocketing on the street or slinking through a cemetery in broad daylight. The script by Bruno Heller tries to capture the attitude of adult Catwoman in a silent, homeless young girl, and the results are very awkward. There have been dozens of interpretations of Batman and his city in the 75 years since their creation, and Gotham has trouble finding the right balance of influences. Christopher Nolan’s Batman trilogy is the most prevalent in terms of visual style, with quite a few cues taken from the similarly Nolan-influenced Arrow in regards to translating that cinematic style for television. The violence is well choreographed, but director Danny Cannon gets a little overzealous with the shaky cam, particularly when characters are running. Like Agents Of S.H.I.E.L.D., Gotham features an overbearing soundtrack that tries to bring the majesty of the movies to the small screen, with composer Graeme Revell utilizing a strange combination of atmospheric orchestral music and rocking electric guitar that distracts from the action rather than enhancing it. The occasional bursts of camp align Gotham with Tim Burton and Joel Schumacher’s takes on the character, which embraced the theatricality of the ’60s TV show and interpreted it through a more modern lens. There’s even a bit of Batman: The Animated Series in the semi-retro setting, making Gotham feel like a city existing somewhere between the past and present. The series is similarly trapped in that temporal limbo, struggling to commit to the characters at this early point in their lives because it is so beholden to what they will become. It’s hard not to draw a connection between Gotham and the comic series Gotham Central, which featured a similar concept spotlighting GCPD detectives. The big difference is that Gotham Central takes place in a city where Batman has been in action for years, so there’s none of the origin story obligations of the Gotham TV show. One of the best DC Comics series of the 21st century, Ed Brubaker and Greg Rucka’s Gotham Central is a cop drama that happens to take place in a superhero world, and it is chiefly concerned with creating captivating, relatable characters. Renee Montoya (Victoria Cartagena) and Crispus Allen (Andrew Stewart Jones)—two key characters in Gotham Central—appear in the Gotham pilot, but their portrayals make it clear that this series isn’t going to operate with the same nuance and depth as the comic. Allen is a cardboard cutout of a character, with a permanent grin that makes me wonder if we’re in for a major twist when it comes to the show’s inevitable Joker reveal, but Montoya’s portrayal is considerably more problematic. Introduced in Batman: The Animated Series, Montoya made the leap into the Batman comics and added some diversity as a Latina female with a steadily expanding role in Gotham City. After years spent defining her character through her skills as a detective, Greg Rucka revealed that Montoya is a lesbian in a phenomenal arc of Gotham Central that approached the development with sophistication and immense emotional weight. In the Gotham pilot, Renee Montoya’s sexuality is put front and center with a scene alluding to her past as the former lover of James Gordon’s fiancée Barbara Kean (Erin Richards, doing her best impression of Nicole Kidman in Batman Forever). The conversation between the two women is one of the episode’s low points, with exceptionally stilted dialogue that garners passionless performances from the actresses. While it’s nice to see this show embracing gay characters (the effeminate characterization of Cobblepot has me curious about his sexual orientation), it’s disheartening to see Heller’s script take such a soapy approach to Montoya’s sexuality. It’s not enough that Montoya dislikes Gordon because she thinks he’s a crooked cop. She also has to dislike him because of her lust for his fiancée, giving her an unnecessary romantic stake in this conflict. It’s a twist that feels forced and cheap, and it’s easy to see this subplot becoming increasingly frustrating down the line. So Bullock and Essen have a heated, exposition-heavy argument that the audience doesn’t hear, and then the exposition part of the argument is repeated immediately afterward. How much more effective would that scene have been if it showed Bullock and Essen fighting? That would be the perfect moment to flesh out the relationship between these two characters, but the only things that are considered important are the background details on Gordon. Hopefully laying a lot of the plot groundwork in the pilot will allow the writers to spend more time diving deeper into these characters, because capturing the complex interpersonal dynamics of a police squad is a big part of creating a successful cop drama. Ben McKenzie and Donal Logue give solid performances as the central pair of Gordon and Bullock, but it’s not until the final act that they start to fully commit to their characters. McKenzie is saddled with a lot of heavy-handed dialogue, particularly during any of his scenes with the grieving Bruce Wayne, but there’s a tortured quality to his performance that suggests a man familiar with the horrors of the world. He’s seen terrible things as a soldier, and he’ll do anything to keep Gotham City from becoming a warzone. Donal Logue is overacting in the first half of the episode, trying really hard to create a contrast between the “slovenly, lackadaisical” Bullock and his uptight, righteous partner. By the end of the episode he’s much more comfortable in the role, dialing back on the more explosive parts of Bullock’s personality and offering a look at a pained, scared man that has made a deal with the devil because he doesn’t have the courage to fight him. The chemistry between Bullock and Gordon finally clicks during their last scene together in the pilot, with Logue revealing Bullock’s vulnerability in hopes that Gordon will sacrifice his morals to save them both. This show’s fate ultimately rests in that core relationship between Gordon and Bullock, and the stronger their characters become, the better Gotham will fare. Joker Watch: Could Fish Mooney’s green-suited stand-up comedian be the future Clown Prince of Crime? My gut tells me “not likely,” but you never know! This episode suddenly becomes a ’90s music video during the montage of Bullock and Gordon’s investigation, and it’s a really jarring transition. Also: hilariously dated. Small details that bug me in this episode: The imagery of Martha Wayne’s pearls falling to the ground is used, even though her necklace doesn’t break (do pearls just detach from a necklace like that? ), and a handcuffed criminal breaks his chains in the GCPD headquarters and in the next shot his handcuffs have completely disappeared from his wrists. That point-of-view shot of Bruce staring down the barrel of a gun is chilling. This episode does strong work highlighting Bruce’s fear in that moment and how that will influence his actions for the rest of his life. I love the funky saxophone music played right before Fish Mooney’s debut. Sets the tone perfectly. Selina Kyle is totally going to be the Annie to Fish Mooney’s Daddy Warbucks. 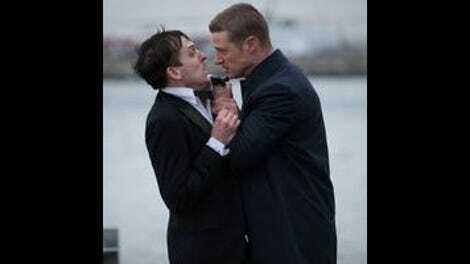 How hard would it have been to have Cobblepot each a raw fish in that last scene? That would have been so much creepier than grabbing a sandwich after killing a guy.